Designing for Specialty Printing Techniques | Pengad Indy Inc. Designing for specialty printing techniques. Specialty printing techniques can make your brilliant design work even more impactful. These techniques can be powerful tools for designers but each technique offers it's own challenges that must be considered during the design process. While these techniques may increase the cost of your piece, using any these techniques properly can add that unique element your piece needs to prompt consumers to not only pick it up but hold on to it longer. Think of die cutting as using a sharpened cookie cutter to cut your piece into a specific shape or to cut a shape into your piece. You can achieve many interesting effects by adding a unique shape to your design. Maybe your logo lends itself to this process or you can let an element on the second page shine through the cover of a booklet. This is the same method used to make boxes, the flat box is cut out of a sheet, scoring the folds or adding perforation simultaneously. It is then easy to fold by either machine or by hand. • Keep all your content at least 1/8" away from the die cut edge, this helps minimize the chance that your content is clipped. • If you're working with a tight budget, ask your print vendor what dies they have in stock that may fit your needs. Custom dies can get expensive. • Prototype. Get out the scissors and craft glue. Cut out your design. If it's a box or something that requires gluing, fully assemble it. Make sure the design works. Then take it apart and lay the paper flat, now you know how it needs to look on the screen and what direction to orient the content. When your prototyping, flip your craft knife over so the cutting side is up or use open scissors. With light pressure drag the blade along any required fold lines. This creates a light score that will give you crisp, exact folds on your prototype. Be careful not to push too hard or you'll cut right through the page. • Make it unique. If you're going to pay for a custom die, why not get the most out of it you can? Don't be afraid to do something you've never seen before. Hot stamping is a method of applying a foil to paper using a heated metal stamp. Foils come in a variety of colors and patterns including metallic, bold and solid pastel colors, holographic, clear, natural textures (wood, marble etc.) and more. Hot stamping is used commonly on business cards, folders and custom binders but can be used on any piece to emphasize any element. Hot stamp your logo, tagline or an important statistic. Use hot stamping to emphasize natural textures or metallic elements. • It can be difficult to achieve and maintain tight registration when hot stamping. If your design requires a tight registration, consult your print vendor on their recommended best practices to ensure the highest quality. • Remember, whatever you stamp will pop off the page, make sure it is an important element you want your customers to see first. • Remember, the foil is literally applied with a hot stamp, there may be a slight indentation. This can cause a slight embossing effect on the other side of the piece. • In your design, represent the hot stamped element by a unique spot color and set it to overprint in your design software. This will allow the pre-press department to easily separate the hot-stamped element from the design when plating (you don't need a printing plate for hot stamping) while still providing a reference for where the final hot stamp needs to be. • Provide a full-size one color graphic of the element to be hot stamped. Vectori-based graphics are usually easiest to work with and translate to a high quality stamp. Embossing is a method of creating a three dimensional design in paper or other material by applying heat and using a both a male and female die. Embossing is a great way to add both new visual and tactile dimensions to your piece. Make your logo pop or emphasize an illustration or product. Embossing can be used as a security measure for formal documents, such as applied by notary publics. Most papers can be embossed however, some papers work especially well, work with your printing company to find the best match. - Glossy or coated paper generally does not emboss well. The combination of heat and pressure used to create the embossed image can crack the coating. Paper can stretch but the coatings used can not, causing the cracking. - Coated and lightweight paper can become brittle when embossed. - The best paper to use for embossing is uncoated, heavier weight stock. Felt finishes also help accentuate the depth and detail in the embossed image. - Set all copy larger than 12 point. - Make all lines at least 2 points. - Thin serifs do not emboss well. - Keep any embossed images at least 1/2" away from the edge of the paper. Embossing an image too close to the edge can cause the edge to wrinkle. Coatings are applied to protect printed materials from exposure to moisture and extreme temperatures, scuffs and scratches and frequent handling. Coatings can improve the appearance of a printed piece and are available in a range of sheen from ultra-glossy to ultra-matte. The appearance of the printed piece can be dramatically altered according to how coatings are specified. Varnishes are petroleum-based sealants that can be applied in-line or via a second pass through the press. Gloss varnishes will deepen colors while a matte varnish has a more neutral effect. A varnish can be applied either as a flood or spot coating. A spot application can be used to add a unique visual element to the piece by creating a more striking contrast between design elements. You can even use a combination of varnishes with different sheen can be applied to provide dramatic, yet subtle, visual effects. As the most flexible of print coatings, varnishes can be applied to any stock, coated or uncoated, including text weight stock. When applied over an uncoated stock, varnishes provide rub protection with minimal visual effect. Aqueous coatings are water-based and can be applied in-line or by a special coater. Aqueous coatings can be more environmentally friendly than UV coatings because they are water based. Compared to varnishes, aqueous coatings stand out a little more as it does not seep into the press sheet. Aqueous coatings provide good protection against dirt, smudges, fingerprints and scratching and can increase your piece's durability. Ultra-violet coatings are the most high gloss coatings available. UV coatings are made from Unsaturated polyesters or polyacrylates, or a combination of the two that, when exposed to ultraviolet light, dry instantly. UV coatings offer excellent rub protection and can be applied in-line or offline via a silk screen process. Because it is cured with UV light, drying is almost instantaneous and can be more environmentally friendly because no solvents enter the atmosphere. However, UV coated pieces can be more difficult to recycle. Laminates come in two forms: film and liquid. Both available in gloss or matte finish, the difference is in application style. As the name suggests, film laminate is laid down over the sheet while liquid laminate is applied like a varnish. Laminates will provide the most durable protection against water, making it the best option for menus, books or anything else that may be exposed to moisture, including perspiration from holding. • Dried inks readily show fingerprints and scuffing, especially in large areas of dark color coverage. 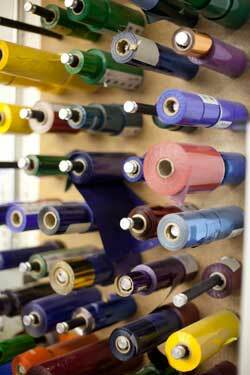 • Press coatings cost less than bindery coatings since bindery coatings are applied over dry ink at slow speeds. • Varnish is the least effective way to prevent scuffing. UV and laminate coatings are far better protections against scuffing and scratching, especially if your publications are multiply shrink-wrapped prior to shipping. • You cannot print, glue, or foil stamp over coatings. If you want to implement some of these other techniques, leave the effected area uncoated. Becasue of these limitations coatings are applied as late ibn the production process as possible. • If you varnish over an uncoated stock, the varnish will seep into the paper and be less visible than if applied to a coated stock. • Spot coatings can provide interesting visual and tactile effects to your piece. • If you are only laminating one side of your piece, consider specifying lay-flat laminate. The interior of this film has many "V"-shaped cuts in the plastic. This will minimize curl when moisture seeps into the uncoated side of the piece. • Designing for a spot coating is quite simple, just follow these steps. - Choose a Pantone color value to represent your coating on the screen. Make sure this color is not used anywhere else in the design so the pre-press department can easily differentiate the coating from the printed parts of your piece. - Apply this spot color over the areas you want the coating. - Make sure any shape representing a spot coating is set to overprint. - Tell your commercial printer's pre-press department what color value you chose and what it represents, communication is key. Providing a written description along with the image can be helpful. It doesn't have to be overly detailed, for example, "Spot coating should be applied to the spray bottle pictured in the bottom right corner. The varnish is represented by PMS 7535 C."
Specialty papers can be used to complement the design of your piece and drastically enhance the consumer's tactile experience with the product. Some stock requires no consideration when designing while others can require extensive mental gymnastics if you're not familiar with its requirements. 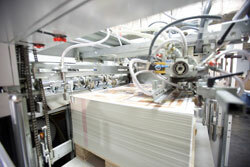 If you are not sure how to choose your paper stock, read Selecting the Right Stock. Once you've chosen your stock, here are some things to consider when creating your design. - This class of stock has a metallic film adhered to one side that shines through your design depending on the amount and type of ink used. - If there are any areas you don't want the metallic effect to be visible, a layer of opaque white ink can be applied before printing to knock-out the effect. Simply specify the elements and we'll handle the rest. - Metallic papers can be tricky to fold and do not emboss well. The metallic film is not always as flexible as the paper it is adhered to, over stressing the material with embossing or excessive folding can cause the film to tear. - Uncoated stock can be used to promote a kinder and gentler image than provided by the bright, shiny feel of a coated stock. - Uncoated stock can increase dot gain in half tone and screened areas. If you foresee this being a problem, design with photographs and illustrations that have high contrast. - Avoid using varnishes to highlight designs on uncoated stock. Uncoated stock will absorb the varnish, providing a different effect. Varnishes can still be used to seal the entire sheet. - High quality color management systems take the uncertainty out of printing on uncoated stock. - High-gloss coated sheets are ideal for printing photographs but not for large amounts of text. - A satin coated sheet provides a level of gloss between matte and gloss and dull is between satin and matte. - It is important to remember that terms like, high-gloss, satin, dull and matte are manufacturer dependent. To ensure you're getting the finish you want, ask to see a sample book. - Different ink, coating and stock combinations sometimes react differently. Talk to your print vendor about your desired final product. Describe it in detail and provide samples if available. - Avoid thin and light type of transparent plastics. Small, light, type might look good printed on an opaque stock but it becomes much more difficult to read printed on a transparent stock. If you have to print a light color, have a layer of opaque white printed behind it to increase readability. Simulating the colors in a continuous tone color image by printing with process colors: Cyan, Magenta, Yellow and Black.